Before starting my review of the MartinLogan Expression ESL 13A hybrid speaker, I feel it is important to know about me, my biases and why I purchased an expensive speaker that no one in the public including most dealers had seen/heard. I am a retired Market Researcher who enjoys listening to classical music. All of my current equipment including interconnects, power cords etc. were purchased by phone, sight unseen, based on the recommendations of a high end audio dealer. For my SACD player, I chose it based on a review. I prefer solid state equipment as it is easier to maintain and in my opinion, produces a cleaner sound that is closer to what is recorded. Yes, I can appreciate a good tube system but many are too soft and warm for my taste. My pet peeve is reading reviews of solid state equipment, including CD players, by writers who have a clear preference for vinyl and tubes. I was an early adopter of the MartinLogan Montis 5 years ago. In the past year I improved the Montis’ performance by adding ASC Tube Traps, then moving the Montis farther from the side and front walls, and placing the speakers’ panels more perpendicular to the floor. With the exception of the Tube Traps the changes I made also significantly increased the amount of bass boom heard on some of my CDs. 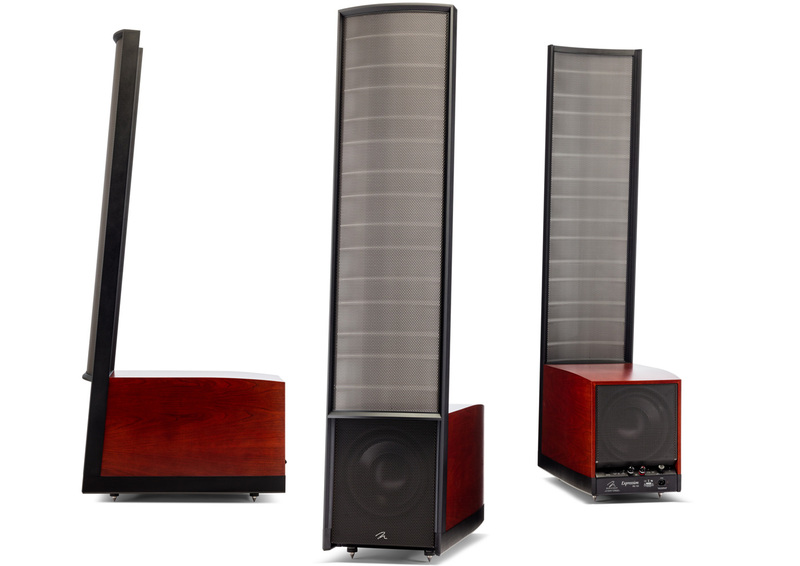 In conversations with a dealer he mentioned the significant improvement he heard with the new MartinLogan Renaissance ESL 15A, which has 15-inch wide electrostatic panels and two 12-inch woofers, and which costs $25K. The Renaissance comes with a built-in Anthem Room Correction digital room equalizer that can reduce bass boom. I told the dealer that if a less expensive version of the ARC-equipped 15A came out, I would buy it. A few days later I got a call from the dealer telling me that MartinLogan was now accepting preorders for two less expensive versions. 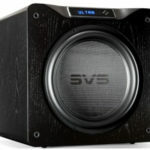 Both new speakers would have built in room equalization — the Expression (13-inch wide panel and two 10-inch woofers) which is the replacement for the Summit X, and the Impression (11-inch wide panel and two 8-inch woofers) which replaces the Montis. The prices of the new speakers at $15K and $10K the pair, respectively were not increased from the prior models. Because production was just starting, no auditions were possible. I gambled and went with the somewhat more expensive Expression. The MartinLogan Expression is a completely new 61-inch tall hybrid speaker which replaces the MartinLogan Summit X. From the front the Summit X and Expression look similar but from the side the Expressions woofer enclosure is longer and more rectangular. The top section of the Expression consists of a slightly curved electrostatic panel in an ultra-rigid frame, about 44 inches tall and 13 inches wide. The rigid frame also runs along the bottom of the woofer enclosure. The 13-inch panel is 2 inches wider with 20% more surface area than the one in the Summit X. The Expression’s curved panel allows for better dispersion of the high frequencies. Inside the panel is a sheet of “Mylar like” material .0005 inch thick that is coated to be conductive. According to MartinLogan, the improved coating allows the panel to be charged with static electricity between closely spaced stators. 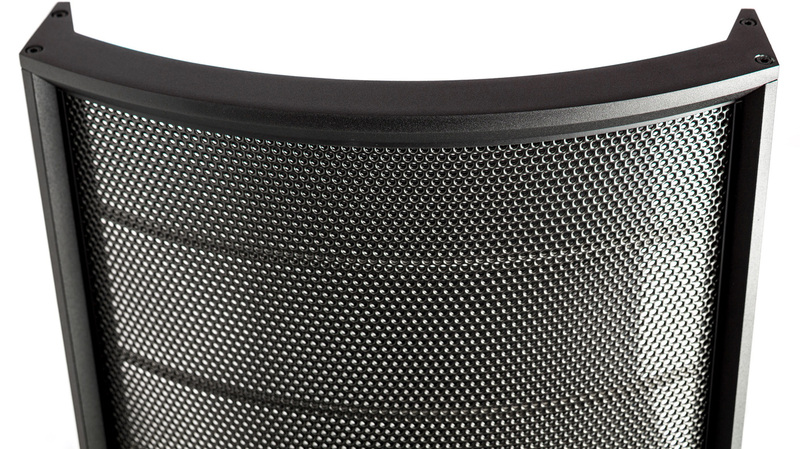 The panel/diaphragm can trace delicate sonic details with precision as the “Mylar like” material has little inertia compared to cone speakers. Instead of having crossover points that results in discontinuities in the sound, the Expression’ panel operates over an exceptionally wide frequency range. The claimed frequency response of the Expression is 24Hz to 23,000 Hz +/-3dB with a single crossover at 300Hz. On paper the frequency response of the Expression is similar to that of the prior Summit X. 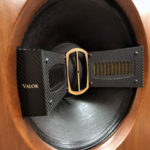 Connected to the panel are two 10-inch aluminum long throw woofers in a cabinet, powered by two 300-watt class D amplifiers. The back-facing woofer is covered by a metal grill. This allows the two horizontally opposed, phase timed drivers (Powered Force Forward) to work together to reduce the reflected energy from the front wall, resulting in “easy placement for clean, pure, powerful bass response.” On the back of the woofer enclosure, near the bottom are two controls — a 75 hertz bass level control (+/- 10 dB) for room acoustics optimization and a 150-250 hertz mid bass control (-2dB,0,+2bB). There are also switches for floor lighting and turning on/off room equalization (ARC). USB and Ethernet connectors are used to connect the Anthem Room Correction with software residing on your PC or laptop. Low frequency transducer: Two 10" PoweredForce Forward woofers with cast basket, high excursion, rigid aluminum cone and extended throw drive assembly, non-resonance asymmetrical chamber format. Impedance: 4 Ohms, 0.7 at 20 Hz. 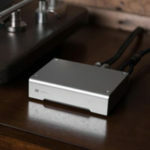 Compatible with 4, 6 or 8 ohm rated amplifiers. Signal inputs: WBT-0703Cu nextgen 5-way binding posts featuring a filigree signal conductor made from gold plated, nickel free, non-ferromagnetic, pure copper for high conductivity and fully insulted. Free from eddy current effects. Panel Dimensions: 44" x 13"
I’m surprised you are getting such good highs with a McIntosh amp. The problem with having a speaker that goes to 1 ohm at higher frequencies is that an amplifier with output transformers can’t impedance match at that frequency so power transfer is reduced. It was true that as each bigger amp was put in place the response improved but not enough. For me the sound never really opened up so I gave up on McIntosh at 300 watts per channel and moved on to a very good direct coupled amp. With my C2300 pre-amp there is excellent transparency and air yet it is never harsh. I will also say that if I was not retired I would buy these speakers for the room correction add-on. Like most men who are older/above 45 I have some roll off in the higher frequencies which may help explain why the Martin Logan Expression seems to have good highs for me. Also having all pure silver power cords, interconnects and speaker cables gives the system detailed and clean highs. I have used pure copper cables in the past but never enjoyed them as much as my WireWorld pure OCC silver cabling. Maybe getting older is the key to a better sounding system? Although, at 66, (I have just had my hearing tested – excellent, particularly considering all the rock concerts attended) I do know that I can’t really hear much above 10KHz. That is based on my playing a disk that sweeps through the frequencies from 20 Hz through 20 KHz. Still the lack of air and high frequency detail that was missing with the McIntosh amps totally stopped me from enjoying my system. That said, the mid-range and bass were wonderful. What McIntosh amp did you own? I have been in contact with both McIntosh and Martin Logan. McIntosh’s technical person feels that when amps have a problem driving Electrostatics it is tube amps which tend to put out a higher voltage and lower current as opposed to solid state amps that put out higher current and lower voltage. The Martin Logan project manager told me that they have no evidence that McIntosh amps have problems driving their speakers. I would note that Martin Logan has used McIntosh amps to demonstrate their CLX electrostatic speaker. I just recently upgraded from the legacy Summits to the Expression 13A’s, and your review is spot on! Adjusting “rake angle” really has significant effects. Of note, I previously purchased the Summit X leg assembly from ML ($500+), and they are fully compatible with the Masterpiece series. They allow adjustments from 11° backward to 1° forward tilt. I’m currently using a 3° rake angle with my Expressions (vs. the default 5°). I don’t know if ML still sells the Summit X leg assemblies separately, but definitely worth checking, if you want to experiment with a wider range of tilt than the default legs offer. I couldn’t agree more with your comments about the rake angle. Martin Logan understates the difference that can occur when the rake angle is changed. Most of my listening is in a chair in the sweet spot. Even a two degree change which sounds insignificant made a significant improvement in the way my Montis and now my Expression sounds. If someone owns a Martin Logan hybrid speaker I would encourage them to experiment with the rake angle. Thanks for the heads up about the leg assembly. I plan to contact ML after the holidays and see if they still offer them. I will let everyone know what I find out. Here is the reply I received from Martin Logan regarding the Summit X leg assembly. “The Summit X had special feet to adjust the rake. These will not fit the Expression. The feet included with the Expression offer significant rake adjustment”. Enjoyed the review. Long time stat fan (acoustat 2+2’s and Beveridge 2sw being notable speakers I longed for but could not afford). Purchased ML reQuests in 2001 and upgraded to my current Summits in 2008. Love the summits and like the other poster if not retired I would seriously consider this model based on your and Stereophile’s Mr. Iverson’s & Atkinson’s experience with the room correction on the bass response. Love Esoteric spinners and having a KO1X on the front end must make for some fantastic listening. Happy Holidays! Excellent review! I personally own a pair of Ethos. Did you by any chance listen to ESL11A or Ethos? I want to upgrade to ESL11A and I am curious what improvements I would hear. Based on your review I already have a pretty good idea from extrapolation but maybe you heard them in person. I have not heard the ESL11A but did speak to a dealer that I trust who felt the 11A is a significant improvement over the Montis it replaces. You will hear a better integrated bass,better imaging and highs. What is tricky to predict is how much difference the room equalization program (ARC) will make in your room. In my case the difference was huge. I would urge you to try to audition the 11a before spending $10K.Make sure its exactly what you are looking for. McIntosh amps with output autoformers will certainly follow the speakers impedance just like any direct coupled transistor amp. They are all rated to be down 3dB at 100KHz so you should be fine. A true world class speaker to complement the Seamless Bass. Great review. Very thoughtful detail in comparisons to the previous generation. I’ve been a long time fan of Martin Logan having owned the CLS (hooked me into electrostats), Quest, and lastly the Summit X. Along the way I’ve owned a number of box speakers but always came back to Logans. Various amps have been in and out along the way including McIntosh. Amp choice has a profound effect on the sound. 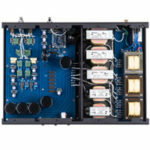 Logans quickly reveal the amp’s ability to handle dynamic load impedance to the extreme. Autoformer based McIntosh amps can sound wonderful if properly mated with the correct autoformer tap and speaker cable. This can mean using my ears not necessarily matching the published speaker impedance with the autoformer tap. Which autoformer tap did you use for your evaluation? Perfect Review. I own the Montis, and tested a few amps with the Montis and other Martin Logans as well. I find the Vintage Krell amps with getting them re-capped is the best I’ve heard. I have 3 Krells and currently using a Krell KSA-200S. The authority of the Krells and the Class A presentation is something I just love. Also, me and many others like to have a Pair of REL subs sitting next to the Logans. The RELs add another dimension to the music and the REL S series hooked directly to each channel on the Krell speaker outputs for a true stereo sub experience is quite the finished product for me. My only next step a few years from now is to get the Expression 15A or 13A model used. Just thought I would mention the Krell amps and REL subs for the Martin Logan speakers. Even a Magico Q5 Demo used the RELs to lift up the whole body of the music. I’m so happy with my system now, that going any further at this point would be selfish on my part. But maybe one day….. some 15As would be nicc.